is, and why we gravitate to this underserved market! The United States Patent and Trademark Office granted Servato our latest patent on the Company's proprietary Adaptive Charging methodology. 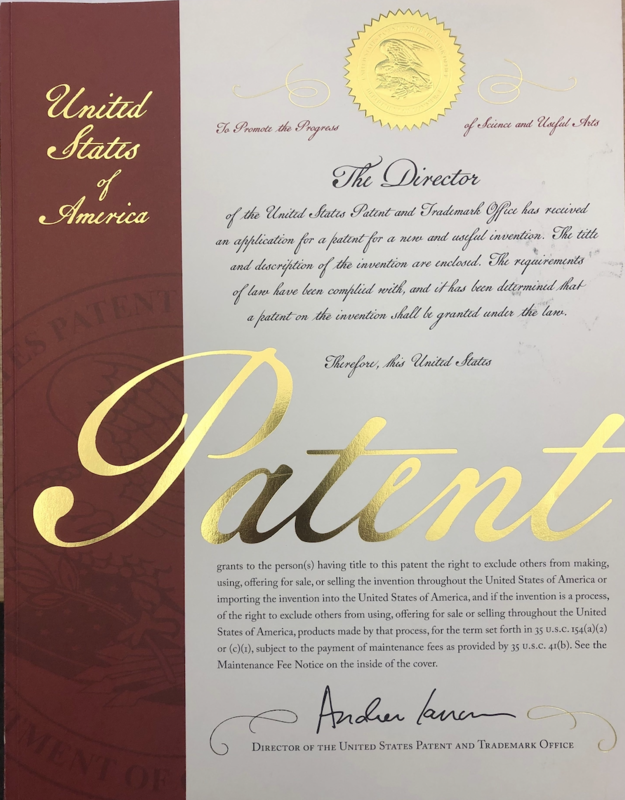 It is a newly issued patent that is a continuation of one of the company’s earlier patents in its battery management patent portfolio. The new claims broaden the scope of protection afforded by the company’s battery management patent portfolio for its novel battery charging system. Servato now has four patents issued and one pending patent application in this technology area. Network engineers use urban America as the canvas for what makes efficient and inclusive design. This lucrative market reaps rewards due to the dense concentration of subscribers in one area. Rural America often gets overlooked in this equation. In the 3/28 episode of Out To Lunch, Tulane professor Peter Ricchiuti interviews President and CEO of Servato, Chris Mangum, alongside another guest. That guest is Carol Morse and founded Acalli Chocolate in New Orleans. This episode titles Recharging and covers some of the challenges of each organization such as rural versus urban network design, as well as, how these reputable founders came to the venture and what the future holds. 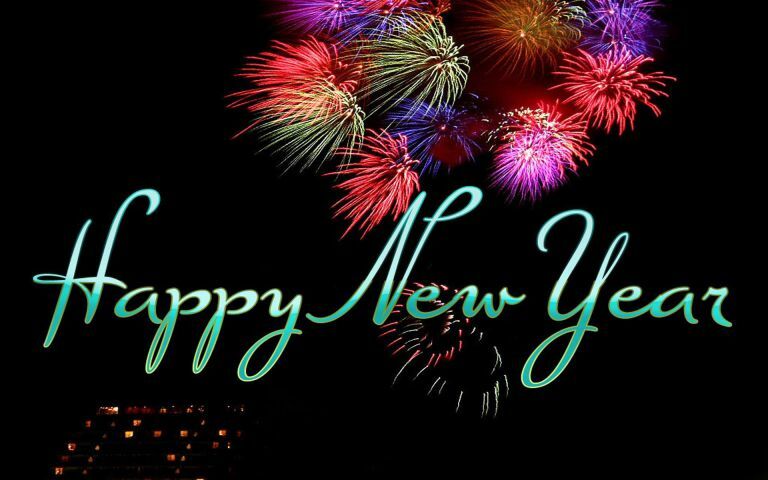 The year of evolution came to a close last week for the Servato team. 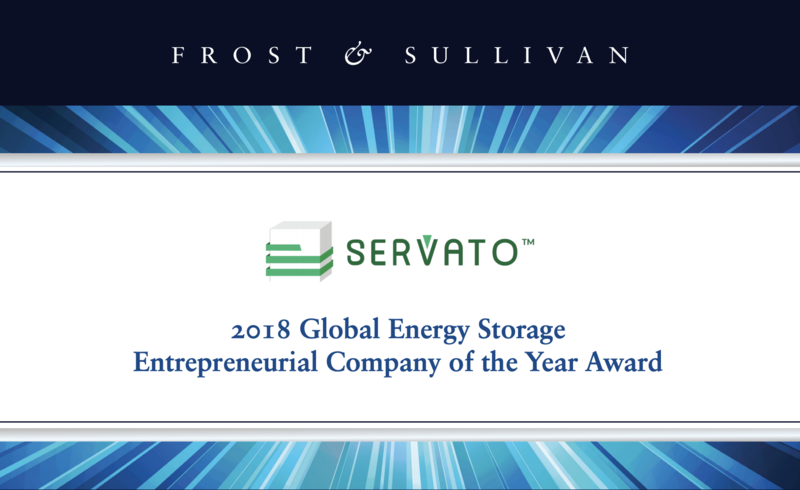 The team traveled thousands of miles spreading the message of managed DC power, developed multiple new products, announced customers and partnerships that invest in hardening the networks in their communities, and spoke at conferences across the country including ISE EXPO in Denver, CO.
Today Servato and analyst firm Frost & Sullivan announced that Servato is named the 2018 Company of the Year in the Energy Storage Industry. The selection of this award is derived from primary market analysis and in-depth interviews conducted by the Frost & Sullivan industry analyst team. The Company of the Year Award selection process is based on excellence in growth, innovation, and leadership. Specifically, superior performance in three key areas — demand generation, brand development, and competitive positioning — play a crucial role when selecting the Company of the Year. While the current focus of the industry is on battery monitoring and how to keep batteries working safely and reliably. Servato has brought a new dimension to the market with a shift from passive battery monitoring to proactive battery management. The company uses a unique, patented methodology (Adaptive Charging) for measuring and charging batteries compared to older technology of float charging batteries. Adaptive charging extends battery life by only charging the battery when it needs to be charged and otherwise resting it. Continuous charging for batteries to keep them at a 100% state of charge has negative consequences, as it accelerates battery failure due to increased temperature, grid corrosion, plate degradation, and dry out. This leads to high replacement costs. Servato introduced Adaptive Charging to remove these harmful mechanisms and charges batteries only when necessary and for as long as necessary to maintain a full charge. Introduced by Servato, adaptive charging “virtually disconnects” standby batteries from continuous charging using a proprietary switch design that allows the batteries to rest yet still be immediately available for discharge when needed. Servato has entered into a commercial relationship with ABB (formerly GE Power) to introduce the first unified rectifier and battery management solutions. It integrates the functionality of Servato’s SPS-248 battery management system with ABB’s rectifier modules. This solution is targeted towards fixed and wireless carriers as it gives them the rectifier that they need to power their telecom equipment with a remote battery management system as added value. This is the first of its kind unified rectifier power and battery management solution. Servato is taking remote power management to the next level to offer the combined value of battery management systems with a highly power efficient rectifier solution from ABB. Servato believes this solution will allow customers to more easily and economically upgrade backup power management infrastructure that is continuing to decay as it is ignored and not enhanced. As per Chris Mangum, CEO of Servato, this is the next evolution in smart rectifiers. The company’s battery management solutions have always been IoT-enabled, giving carriers the ability to monitor and maintain not only batteries and rectifiers but other systems (generators, hard contact alarms) remotely to save on costly manual intervention. This is the future now and demonstrates how two important components of a carriers’ power infrastructure have been combined to offer unprecedented value. NEW ORLEANS and DENVER – August 14, 2018 – Servato Corp., a leading provider of energy management solutions, announced here today at ISE EXPO the latest solution in its Smart Power System solutions suite that offers the latest in remote battery management. The SPS-Rtm is the first of its kind unified rectifier power and battery manage solution. It integrates the functionality of Servato’s industry leading SPS-248 battery management system with GE’s Rectifier Modules. Servato is taking remote power management to the next level to offer the combined value of battery management systems with a highly power efficient rectifier solution from GE. The SPS-R is the most economical way for fixed and wireless carriers to buy the rectifier they need with remote battery management as added value. 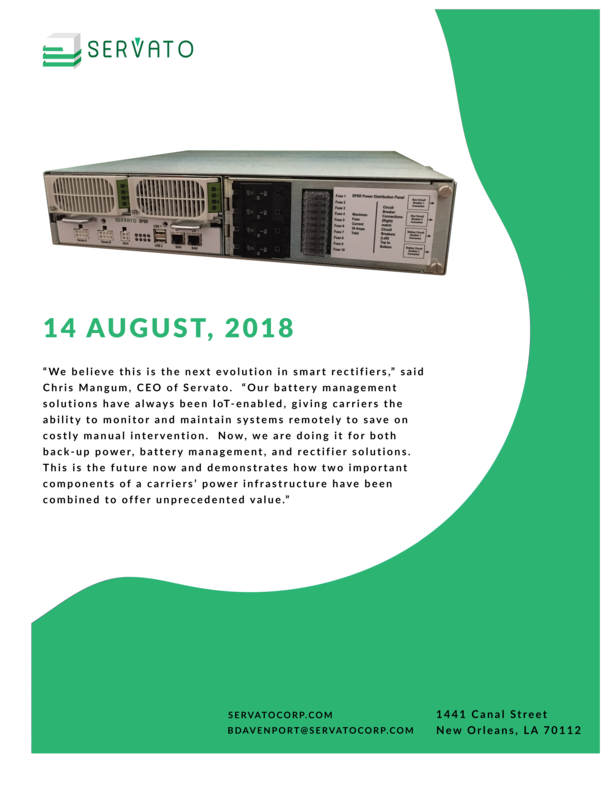 Servato believes this solution will allow customers to more easily and economically upgrade backup power management infrastructure that is continuing to decay as it is neglected and not improved. According to Mangum, the feedback from early customer testing is that this next generation smart rectifier will quicken adoption of power management and maintenance because it is built into the rectifier that is necessary for system power. It becomes an easy decision for operators as they replace rectifiers. SPS-248 functionality – Introduced in late 2017 as an upgrade to Servato’s SPS-148, the SPS-248 provides battery management, testing, and data. It eliminates the need for time-consuming and inaccurate manual testing and provides real-time data from sites, including temperature data and other environmental risk factors. It goes beyond simple tests – automatically conduct load tests and gather more accurate off-charge data. With its adaptive charging methodology, it doubles the life of the batteries. And, it allows customers to manage resources effectively during outages. Active Battery Management Software – Easy to use Actiview® dashboard simplifies battery issues for technicians so they can remotely diagnose and correct issues without sending a technician onsite. Predictive analytics based on over 90 million hours of batter data help predict battery failure 30-60 days in advance before causing network outage or ruins other batteries in a string. Actiview can be seamlessly integrated into a NOC. GE Rectifiers – Best in class 1200/2000-watt GE OEM power supply modules with the SPS-R seamlessly integrated within the rectifier for ease of use. All 10 GMT fuses, breakers, power modules, and SPS module are located on the front panel for easy accessibility. According to Mangum, the SPS-R is being showcased at ISE EXPO with demonstrations for potential customers at the Servato booth number 619. The system will be generally available on 1/1/2019. WILLCOX, AZ and NEW ORLEANS, LA – August 6th, 2018 – Servato, leading provider of active battery management solutions to telecom, power, transportation, and solar companies, announced today that Valley Telephone of Willcox, AZ will be joining other service providers currently deploying Servato’s battery management systems across the country. Over the course of the coming year, Valley will retrofit existing sites and add new sites with Servato’s patented service assurance technologies enabling Valley Telephone to deliver uninterrupted services to their customers. Servato plans to expand its management & monitoring services to include other key site infrastructure components. Valley’s investment in the network using Servato’s technology will serve as the foundation for an even more reliable network especially during power outages in Arizona and New Mexico where distance to and between sites can delay restoration of service. 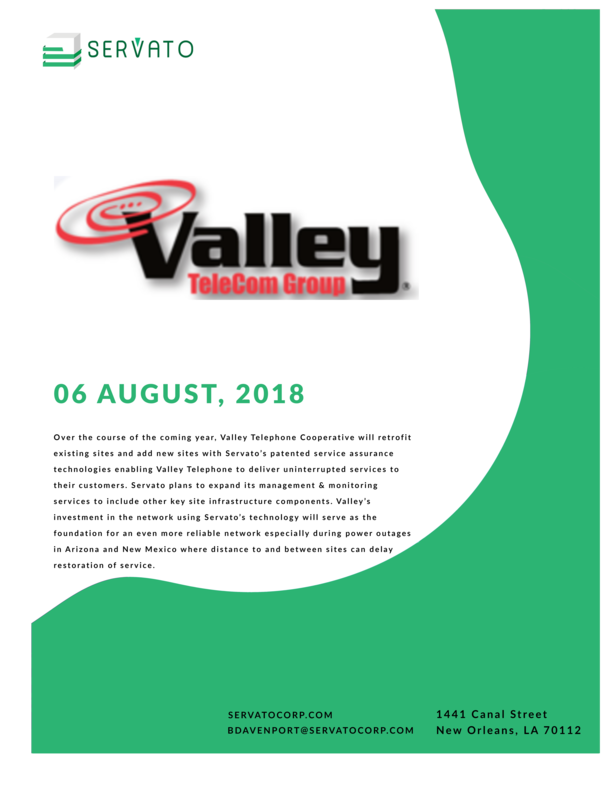 Valley Telephone Cooperative was founded in 1962 after the underserved population of rural southeastern Arizona and southeastern New Mexico banded together to create a new service offering. The remaining century brought new opportunities for Valley to serve the people in surrounding regions by initially offering landline voice services and now additionally providing enhanced High-Speed Internet and business services. Now fifty-six years after establishment, Valley continues to impress its communities by ensuring reliability for over 7,000 rural customers. Today, twenty rural communities have connectivity through Valley Telephone Cooperative. These small communities now have similar opportunities to those in urbanized areas because of the commitment to serve a customer despite the rural landscape. Valley’s sprawling network is a challenge to maintain; however, their forward-thinking investment in Servato’s data platform streamlines it all. “As a customer myself, I’m looking forward to the improved reliability that Servato products are bringing to our infrastructure. And as an employee I’m proud of how we look to the future to constantly improve and upgrade the services we provide our customers.” Heath Bowen – Network Manager. Network Operators can have confidence with Servato installed. The backup batteries will provide expected backup power when required, especially during unpredictable, inclement weather. Streamlining recovery efforts, doubling battery life, remotely managing and monitoring battery health, and predicting rectifier and battery failures has empowered providers across the country to provide enhanced reliable services to their customers. The majority of the remote carriers have been commissioned into service already with anticipation of the remainder of the project being complete by 2019. Valley Telephone Cooperative serves communities in southern Arizona and New Mexico, providing phone and internet services. The company has stayed true to their core principles of service, community, and innovation for over 50 years. Learn more at http://www.vtc.net to see how local businesses and residents utilize Valley services. AURORA, Colo. & NEW ORLEANS--(BUSINESS WIRE)--Power Product Services (“PPS”) serves customers from Phoenix to North Dakota, encompassing a large portion of America’s rural landscape. In this environment, “Always on” can be a tough standard to maintain. This is why PPS has chosen to design smarter power systems that incorporate remote management, predictive analytics, and overall quality. Since 1991, the PPS brand has represented a holistic approach to power system design and continuous innovation. PPS’ arsenal now includes Servato’s ability to expand battery life and streamline maintenance. 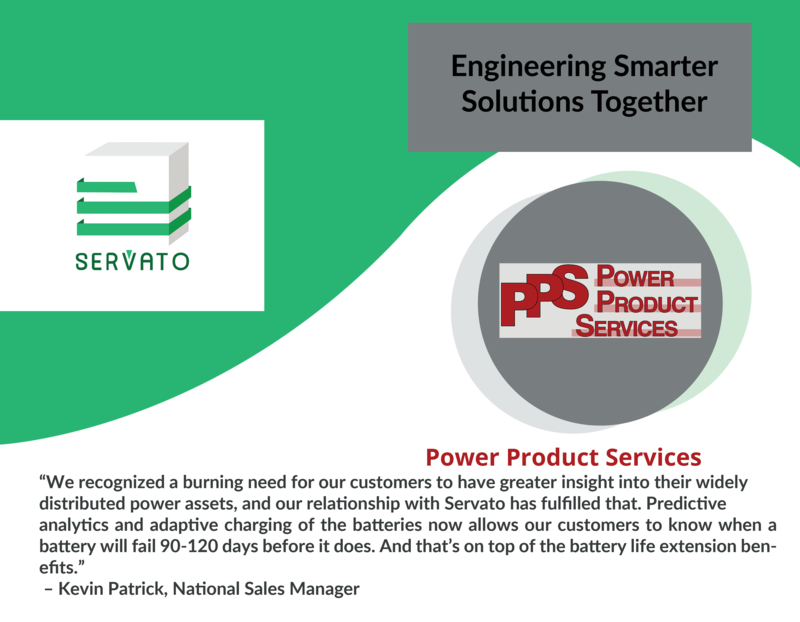 Power Product Services will design and implement hundreds of original DC power plants this year with Servato hardware sending battery and site data into the cloud. Retrofits will also be executed where customer battery testing can now be replaced with Servato’s real-time analytics. The PPS and Servato partnership is poised to bring a committed team of power experts that are always available to help from routine maintenance to outage scenarios. PPS is a major service provider of DC Power, Tower Installation, CAT 5/6, Fiber Optic installation, testing and service. Whether your needs are in Phoenix metro or rural North Dakota, we provide dependable and reliable service. Contact one of our qualified sales personnel for details on our certified IEEE preventative maintenance plans, a quotation or a free DC power evaluation. Backup Batteries are almost always out of site and out of mind. Most engineers and managers try to spend as little time as possible working on them in order to spend more time delivering better service. But when battery issues are a problem, frustration ensues. Copyright 2015 Servato Corp. | All Rights Reserved.